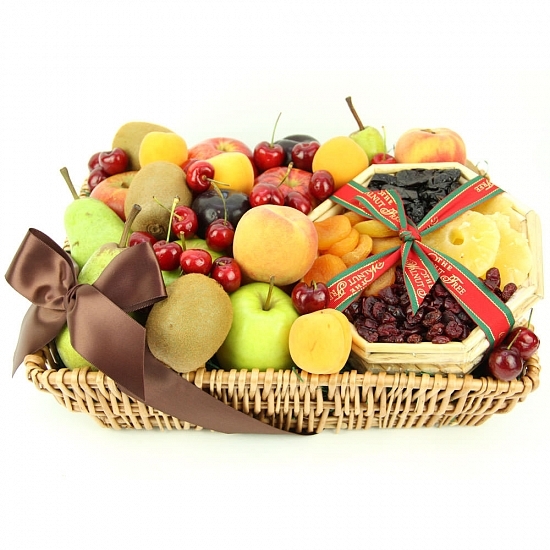 The best way to give someone a lavish food gift is to buy them this Tropical Mix Fruit Basket. It is a joyful basket with a collection of vibrant fruits variety as well as a token of dry fruits, all packed together in a cane basket with a silky ribbon. You can choose this fruit hamper for delivery to UK on any sort of event or celebrations like Birthday, Christmas, Thanksgiving, or anyother eventful moment with your loved ones. Your family and friends will love this lavish treat of stylish fruit basket delivered by post with your personal message card attached.